It is noted that Jakarta Industry and Energy Dept. has installed 37,115 LED SS lamps in the capital. This realization has touched 65 percent of the target set at 57,101 units this year.
" This year we mostly do installation in East Jakarta and West Jakarta"
Jakarta Industry and Energy Dept. 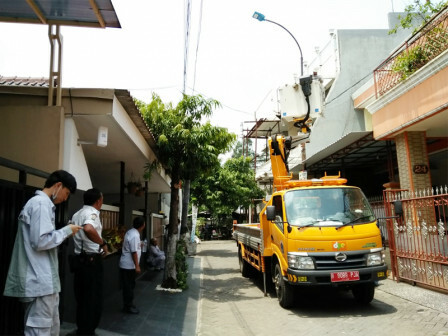 's Lighting Section Head, Syamsul Bakhri stated that LED SS lamp installation is carried out along Jalan MHT (alley), neighborhood road, connecting road, and protocol road. "LED SS lamp that has been used since 2016 until now has made us able to make streetlight electricity payment efficiency almost 47 percent," he expressed, Friday (11/9). This year, its installation is targeting 1,863 units in North Jakarta, 18,033 units in West Jakarta, 30,421 units in East Jakarta, 5,097 units in South Jakarta, and 1,687 units in Central Jakarta. "This year we mostly do installation in East Jakarta and West Jakarta. All is targeted to be finished by the end of this year," stated Bakhri, who recently received an award certificate as an Outstanding Civil Servant (PNS) under Jakarta Provincial Government. He added that electric power used in each streetlight point is varied, ranging from 40 watts, 90 watts, 120 watts, and 200 watts. "LED LSS powered 200 watts is usually used for protocol road, 120 watts on connecting road, 90 watts on neighborhood road, and 40 watts on Jalan MHT," he said.